Excessive thirst is most commonly due to dehydration. If the liquid intake is low, or excessive amounts of liquid are lost through sweating and/or diarrhea, the sufferer becomes thirsty, and an increased intake of liquid will rehydrate the body. The same effect may be noticed may be noticed the morning after a night of excessive alcohol consumption. 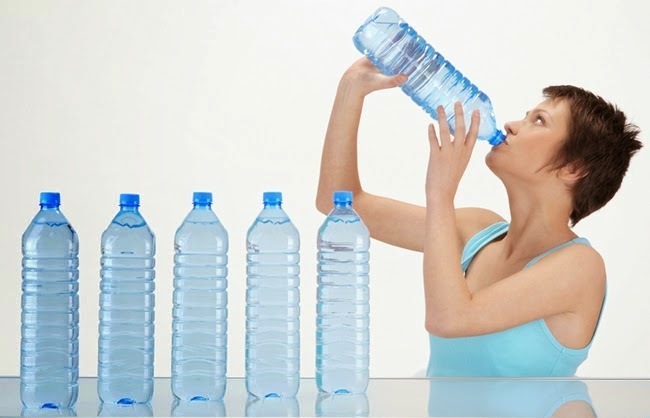 Excessive thirst may also be a symptom of diabetes, kidney failure, and use of certain drugs or nausea. Take one glass of watermelon juice and mix lemon juice with candy sugar in it. Those who feel thirst after drinking water try this magical tip to stop and reduce excessive thirst. In a severe conditions use this tip continuously for one week. Apple Juice with Normal Water to Reduce Excessive Thirst Mix 250 g water in 25-30 g apple juice and drink it to treat excessive thirst problem naturally and fast. Blend 6 g (khurfa), 6 g cucumber and 3 g (kakri) seeds in 125 g water. Now filter this water and drink ¼ cup after every 2 hours. Best and fast effective tip to reduce excessive thirst naturally. Soak 50 g tamarind, 50 g dry plum and 50 g dry coriander seeds in 4 liter water. Next morning remove tamarind and dry plum seeds now blend it in same water and ad natural sugar to taste in it. Best tip to treat hiccups naturally. Soak 20 grams Tragacanth gum/Stercullia gum (gond katira), 20 grams Psyllium husk and 20 g (tukhum e balangoon) in 1/2 liter boiled and cold milk. Leave it overnight and next morning grinds it with natural candy. Drink it daily for one week to treat the hiccups problem. Soak 20 g dry coriander in half liter water in a clay utensil overnight. Next morning blend it and filter it. Ad natural sugar to taste and give it to the sufferer half cup after every one hour to treat the excessive thirst problem. Mix 2-3 tablespoons of barley powder in one glass of sandal wood syrup and drink it. Try to take 5-6 times one glass daily to reduce excessive thirst problem naturally. Compress pumpkin pulp and get 25 g extracts, ad 15 g natural sugar and 250 g normal water in pumpkin extracts. Take 10-15 g after every 1 or 2 hour to solve the excessive thirst problem naturally. Make a paste with jamunum seeds and mix it in water. Add black salt to taste and 1-2 pinches of black cumin powder before drink it. Very effective tip that is good to reduce excessive thirst due to diarrhea.